The bubble column reactor after injection of oil premixed with Span 80 (left) or DOSS (right). Photo courtesy of Francisco Hung. 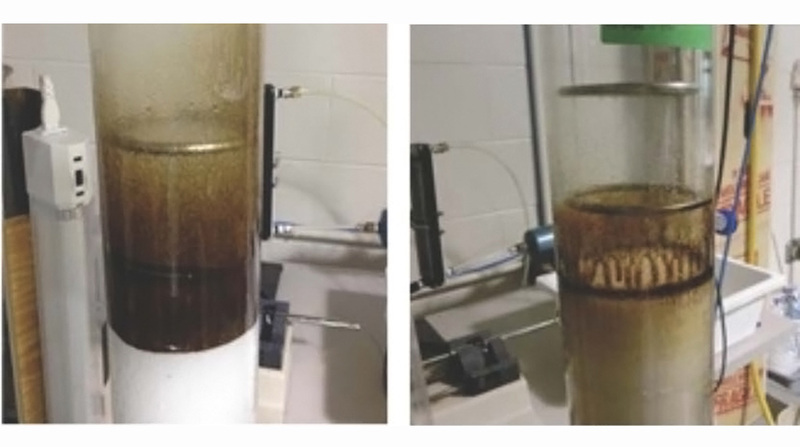 Researchers combined laboratory experiments and molecular simulations to examine how two Corexit surfactants – DOSS (dioctyl sulfosuccinate) and Span 80 – individually affect oil aerosolization. Using a bubble column reactor, the scientists found that more oil hydrocarbons (alkanes) were ejected when Span 80 was present (by more than an order of magnitude for heavy hydrocarbons) than when DOSS was present. Molecular simulations show that Span 80 increased the likelihood that alkanes would adsorb at the surface of seawater droplets, compared to DOSS or no surfactant, and eject into the atmosphere through bursting bubbles and breaking waves. The team published their findings in The Journal of Physical Chemistry A: Combined experimental and molecular simulation investigation of the individual effects of Corexit surfactants on the aerosolization of oil spill matter. The Deepwater Horizon oil spill prompted studies that examined the toxicity and environmental fate of oil in water and sediments, but few addressed oil transport into the atmosphere. “During an oil spill in the sea, volatile oil components can quickly reach the sea surface and evaporate into the atmosphere, but our studies suggest than non-volatile oil compounds can be aerosolized into air through whitecaps and bursting bubbles at the sea surface,” explained study author Francisco Hung. This study builds on previous research by the authors (Ehrenhauser et al, 2014) and addresses the fundamental properties of oil alkanes and surfactants at the air-seawater interface relevant to oil aerosolization. Alkanes exhibited a thermodynamic preference to remain at the air-seawater interface regardless of the absence or presence of surfactants. The presence of Span 80 made the air-water interface more stable for alkane adsorption relative to DOSS. Span 80 has a larger thermodynamic incentive to move from the seawater phase and into the air-seawater interface as compared to DOSS, which contributed to increased ejection quantities. The researchers emphasized that while both thermodynamics and transport processes play important roles in the aerosolization of oil spill matter, their molecular simulations only examined thermodynamics. Describing their findings, Hung said, “Non-volatile components from oil and Corexit dispersants can adsorb very strongly to the surface of water droplets. Because breaking waves generate a lot of sea sprays, this suggests that important quantities of oil spill matter can be transported into the air via this aerosolization mechanism.” Hung said that the aerosols generated are part of particulate matter, a common air pollutant monitored by the EPA because of its negative effects on human health and the environment. Data are publicly available through the Gulf of Mexico Research Initiative Information & Data Cooperative (GRIIDC) at doi:10.7266/N73R0QW8. The study’s authors are Zenghui Zhang, Paria Avij, Matt J. Perkins, Thilanga P. Liyana-Arachchi, Jennifer A. Field, Kalliat T. Valsaraj, and Francisco R. Hung. This research was made possible in part by a grant from the Gulf of Mexico Research Initiative (GoMRI) to the Consortium for the Molecular Engineering of Dispersant Systems (C-MEDS) and Ecosystem Impacts of Oil and Gas Inputs to the Gulf-2 (ECOGIG-2) consortium. Other funding sources included the National Institute of Environmental Health Sciences of the National Institutes of Health (Award Number T32ES007060).